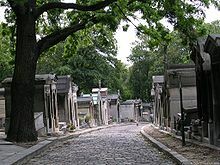 A cemetery or a graveyard is a place (usually surrounded by a fence) where people bury dead bodies and honor the dead people. Many of them have gardens and other greenery in them to symbolise life and to honor those who are dead. This page was last changed on 10 March 2019, at 19:25.